When you're looking for a plumber or HVAC contractor in Alpharetta, look no further than Ragsdale Heating, Air & Plumbing! We are the name Alpharetta residents have come to trust over our 20+ years doing business in the Atlanta metro area. Why? We focus on providing all our customers with an enjoyable experience and 100% satisfaction. We know it can be stressful when HVAC and plumbing problems occur. We work hard to resolve your issues and make the experience as pleasant as it can be. With years of experience and ongoing training, our plumbers and heating & AC repair experts will make sure your issues are resolved quickly and correctly. When we started Ragsdale Heating, Air & Plumbing many years ago, we had one goal in mind - providing families and businesses with comfort solutions that fit not only their lifestyle but also their pocketbook. Call today to get us to your Alpharetta home or office whether you need routine maintenance, emergency repair, replacement equipment. When your furnace or air conditioner quits on you, you need an HVAC company you can trust to get it up and running quickly and correctly. You can count on us to make that happen. We repair all makes and models of heating and cooling systems and offer a 100% satisfaction guarantee. Our HVAC repair pros are skilled technicians, not salesmen. They will be entirely focused on finding the best way to fix your HVAC problem, not selling you things you don't need or want. We hire only the best and friendliest people and our HVAC repair technicians are experienced and factory-trained so they can handle any heating or air conditioning problem you throw at them. Making people happy by giving them what they need is what we are all about. Sure, we repair, service, sell and install heating and air conditioning systems, but we are also in the business of helping people. So, how can we help you today? Whether it's a clogged drain, a water heater not producing hot water, or sewer line issues, we know how stressful any plumbing can be. Put your mind at ease and give Ragsdale a call! Our expert plumbers will provide the quality service you deserve. They will perform a thorough examination of your plumbing problems and take the time to help you understand all your repair or replacement options before their work begins. We understand your time is valuable, and our plumbers strive to arrive within the scheduled time frame. When you call Ragsdale you can rely on our licensed and experienced plumbers to deliver exceptional plumbing service. Why call us when you need a plumber? No Surprises – When you use an hourly plumber, you may get an estimate before the work begins, but it can change drastically once the bill arrives. We provide flat-rate pricing. That means you’ll pay the same, even if it takes us longer than expected to repair your plumbing issue. A job done right – Because our plumbers can take time to ensure the job is done right without worrying about racking up your bill, you can rest assured the job will be performed correctly the first time. Peace of mind – Eliminate worry and anxiety. Your plumbing job will be performed by skilled plumbers at a fair, fixed price. We have the best warranties available to make sure your HVAC system and plumbing equipment meet the comfort and needs of your family. Our plumbers and heating & air conditioning techs receive ongoing training, ensuring your repair or installation is performed right the first time. Our team will always bring an attitude of confidence and integrity and make sure you are well taken care of. We stand behind our products and workmanship and always do our best to ensure you are 100% satisfied! “We were having a problem with the roof plumbing vent to our downstairs bathroom and called Ragsdale. The service tech, James, knew exactly what the problem was as soon as we described the issue we were having and made the repair quickly and efficiently. We have also used Ragsdale several times for AC/heating issues and service has always been excellent. 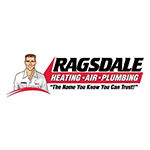 I would highly recommend Ragsdale for any AC, heating or plumbing problems!” – James E.